The Joint Contracts Tribunal issued a new Design and Build Form in 2005, a successor to the JCT Standard Form of Building Contract with Contractor’s Design. It looks substantially different from its predecessor and it is different in structure and often in its wording. This major new edition of David Chappell’s well regarded book has been substantially revised to take account of the new contract terms and different structure. It also considers the standard novation agreements from the CIC and City of London Law Society and more then 70 additional cases. David Chappell BA(Hons Arch), MA(Arch), MA(Law), PhD, RIBA has worked as an architect in the public and private sectors and is currently the Director of David Chappell Consultancy Ltd. He frequently acts as an adjudicator and is author of ten books on construction law for Blackwell Publishing. 3.1 General principles of design liability. 3.2 Liability under the contract. 3.3 Design liability optional arrangements and consequences. 3.4 Consultant switch and novation. 3.6 In house or sub let. 4.1 Express and implied terms. 5. THE EMPLOYER'S POWERS AND DUTIES. 5.2 Express and implied terms. 6. SUB CONTRACTORS AND SUPPLIERS. 6.4 The Construction (Design and Management) Regulations 2007. 6.5 Work not forming part of the contract. 6.6 Third party rights and collateral warranties. 7. POSSESSION, PRACTICAL COMPLETION AND RECTIFICATION. 9.2 Application for direct loss and/or expense. 9.3 Supplementary provision procedures (S7). 9.4 Grounds for direct loss and/or expense. 10.4 Employer's right to withhold payment or to deduct. 10.9 Valuation of changes under the supplementary provisions. 11.1 Injury to persons and property. 11.3 Insurance of the Works. 11.4 Insurance of the Works: new building. 11.5 Insurance of the Works: existing building. 11.7 The Joint Fire Code. 12.3 Termination by the employer. 12.4 Termination by the contractor. 12.5 Termination by either party. 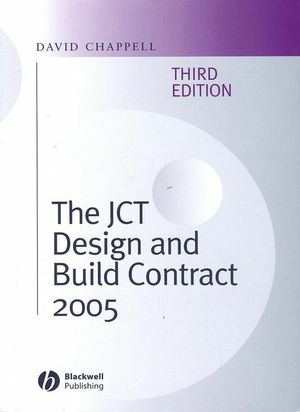 Revised to cover the new 2005 JCT Design and Build Contracts. Also covers the effects of two key legal cases and new legislation on third party risks. Written by well known contracts commentator and highly successful Blackwell author.